The return of weary travelers begins again this spring as it has for years beyond our counting, as female sea turtles migrate back to Brevard’s beaches to begin the cycle of life anew. Last years’ hurricanes left Brevard’s beaches in shambles and likely destroyed any nests incubating at the time of the storms. How many times has this happened in the past? How will it affect the long term survival of these ancient and imperiled mariners of the sea? Time will give us insight into this question maybe after it’s too late. Maybe instead, in time we will be celebrating the survival and recovery of these magnificent creatures. There’s a Florida organization working towards helping our sea turtle populations get back to their former numbers. The Caribbean Conservation Commission (CCC) was founded in 1959, by Dr. Archie Carr and a group of fellow scientists, with the mission of protecting sea turtles and their habitats and to promote the survival and recovery of the ancient marine turtles found nesting in Brevard and using our coastal and estuarine waters. David Godfrey serves as the Executive Director of the CCC and was asked to answer the following questions. Are there any CCC sponsored activities currently ongoing in Brevard? Currently, CCC is administering the N.E.S.T.S. (Neighbors Ensuring Sea Turtle Survival) program. This is an education and outreach program aimed at getting beachfront residents to adhere to a sort of “code of conduct” to help protect sea turtles and their nesting beaches. CCC also conducts educational sea turtle walks in the Archie Carr Refuge. These walks are done in association with the US Fish and Wildlife Service. People can contact CCC for information about signing up for one of the walks, which begin in June. We also host the Annual “Drive for the Greens Golf Tournament,” which is held each November at Aquarina Golf and Country Club on A1A. Unfortunately, the event had to be canceled last year due to the impacts of the hurricane season. All proceeds support CCC’s educational activities in Brevard County. CCC is also working with Brevard County to develop educational materials and programs for the soon-to-be-constructed Barrier Island Ecosystem Center. Once it opens in early 2006, CCC will permanently staff the facility, located on A1A near Sebastian Inlet. We will, at that time, offer numerous educational opportunities for residents and visitors to Brevard County. Describe the role of the CCC at the forthcoming Barrier Island Ecosystem Center. I jumped the gun a bit on the last question. See above reply. CCC has been contracted by the county to run the education programs offered at the BIEC. From this site, we will also coordinate a volunteer program, through which local residents will be given opportunities to help run the facility and participate in various educational programs for school kids and other visitors. Where do you picture Brevard being in 5 to 10 years? It will be right were it is now, one would hope, but the beaches may have receded a bit more. I hope the county continues to lead by example in the way it works to preserve the natural beaches by discouraging sea walls and other forms of armoring. Along the way, the county will have fully developed the BIEC and will be providing a world-class educational experience for people to learn about the barrier island and the globally important sea turtle populations that nest on Brevard shores and live as juveniles in the Indian River Lagoon. What makes Brevard so special? There are lots of reasons for this, but from a sea turtle perspective, Brevard County is the most important location in the world for loggerhead nesting. Its beaches and waters play a critical role in the survival of several species of marine turtles. Turtles that were hatched on beaches throughout the Western Hemisphere actually travel to Brevard County waters as juvenile turtles, where they live and grow until they are ready to join the adult populations. In this way, Brevard County plays a critical role in the survival of several species and nesting colonies from around the world. What are your major concerns for the county’s natural environments? CCC is particularly worried about how the county maintains the quality of its natural, sandy beaches. Water quality in the Indian River Lagoon is another major issue for marine turtles. An increasing number of juvenile turtles are found with life threatening tumors. This disease has been linked to poor water quality caused by chemical runoff from residential and agricultural areas. Efforts to reduce harmful runoff and to clean up the Lagoon will be important in the years to come–not only for turtles but for citizens as well. What role does the CCC play in addressing your concerns for Brevard? Through our association with the BIEC and some of the other programs we conduct, CCC can help raise awareness and concern for marine turtles and their habitats. Through our association with the Sea Turtle Grants Program, funded through the sea turtle license plate, CCC is in a position to help direct financial support to particular research, conservation and education programs that benefit the sea turtles that inhabit Brevard County waters and nest on its beaches. 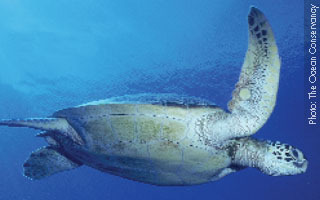 The CCC has targeted sea turtles for protection. Can you name a few other species of commercially/recreationally important species that benefit from sea turtle conservation? First of all, mankind benefits from sea turtle conservation because of the valuable role they play in coastal and marine ecosystems. Turtle nesting helps bring nutrients to the beaches, which in turn helps feed coastal plant life, thus stabilizing dunes. Green turtles graze in sea grass beds, which keeps these habitats healthy for numerous commercially valuable species. Hawksbill turtles keep coral reefs clean, which in turn provide important habitat for fish species and which drive a thriving dive industry. Leatherback turtles help control jellyfish populations, which otherwise might clog commercial fishing nets. Most importantly, sea turtles can be part of a thriving ecotourism based economy, which attracts people from around the world to witness sea turtle nesting. Few places offer the opportunity to see marine turtles the way Brevard County does. You can support Sea Turtle Conservation and Research Efforts by Joining CCC/STSL and by Adopting-A-Turtle! Visit www.cccturtle.org to connect and look for a spotlight on the group next month.